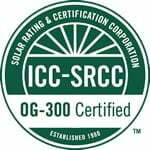 SunMaxx Solar is pleased to announce that their Simple Drainback Kits with Flat Plates and Evacuated Tubes are now SRCC OG300 Certified. SunMaxx Solar is outperforming the competition based on system performance according to SRCC-OG300 system ratings (weather data used: Albany, NY). The HelioMaxx SDB kits by SunMaxx Solar use industry leading SRCC certified OG100 rated evacuated tube collectors and the SRCC certified OG100 TitanPower Plus SU2 Flat Plate Collectors. These low maintenance systems bring the simplicity of drainback systems together with some of the better characteristics of pressurized systems to create the easiest installation on the market. SunMaxx Solars newly released 3rd Generation Simple Drainback Systems are even more efficient in design, components and function. Sunmaxx Solar is only company providing an OG 300 kit that has 20 year warranty available on its panels. SunMaxx Solar has been working hard to produce a product line for its installers and customers which are compatible with numerous United States incentive programs. The SRCC OG 300 Certification has accomplished this goal! For more information on SunMaxx Solar industry leading kits please go to http://www.sunmaxxsolar.com/pre-packaged-solar-hot-water-heating-kits.php. For more information, please visit SunMaxx Solar online at www.sunmaxxsolar.com, or contact a SunMaxx Solar thermal specialist at 1.877.786.6299.